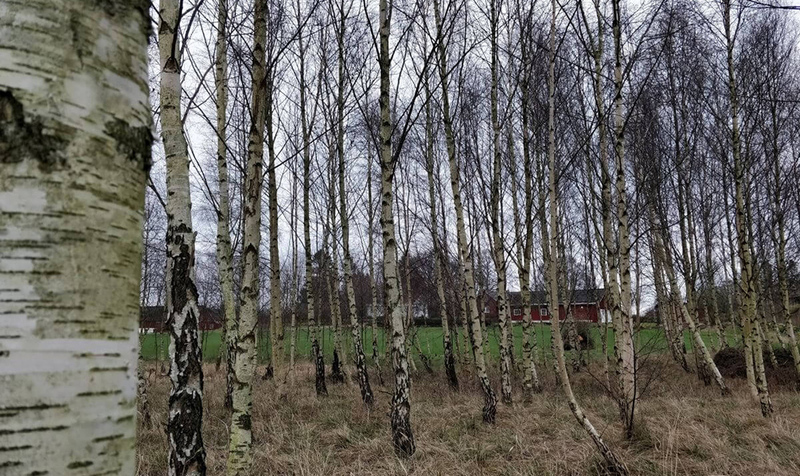 In this post we will look at the thermal conductivity of green wood, more specifically birch from the Swedish west coast. Green wood has a high moisture level and is often allowed to season, or dry, before being used. With the shifting moisture levels, also the thermal transport properties of the wood will change. To investigate how large these changes are, this article will be the first in a series where we will follow a sample as it dries. A suitable specimen was cut in the small birch grove seen in the title picture and divided into three pieces. The larger specimen was used for testing with a TLS-100 thermal conductivity meter and the smaller pieces with a TPS 2500 S thermal conductivity analyser. 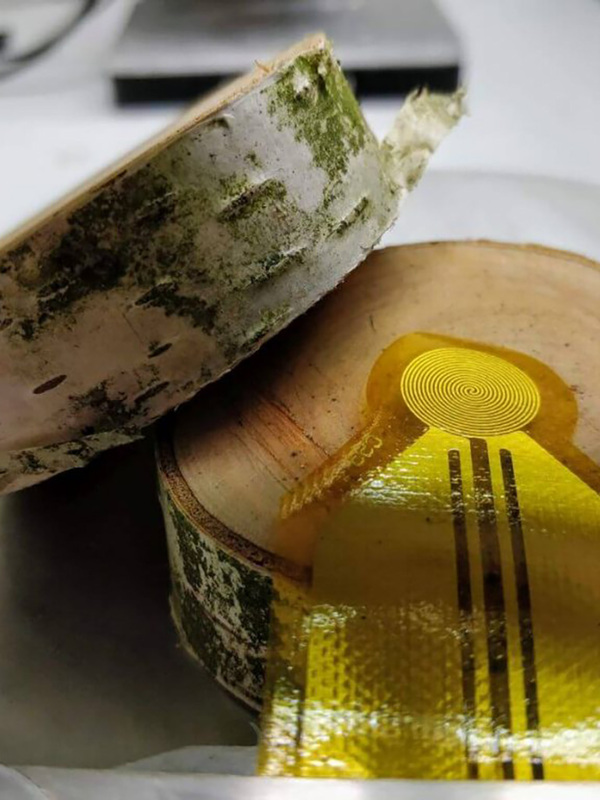 For TLS testing, a 10 cm deep hole with a 2 mm diameter was drilled along the core of the sample, while the smaller samples were sanded to a smooth surface for the TPS analysis. All samples were then transferred to the laboratory and left over-night to allow the samples to reach uniform room temperature through-out the sample bodies. To avoid evaporation before testing, the samples were sealed in plastic bags. Samples of birch. The long log is intended for TLS-100 testing and the smaller, disc shaped samples, are prepared for being analysed by a TPS 2500 S.
The following day, the samples were set up for testing. The TLS-100 needle was inserted in the prepared hole and to make sure that the contact resistance was kept to a minimum, thermal paste was introduced. For TPS testing, the sensor was sandwiched between the sample pieces. Both setups can be viewed below. TLS-100 and sample, prepared for testing. TPS sensor and sample pieces, seen before final assembly. Now some notes on the structure of wood. As a result of how trees grow, the wood material is anisotropic. Fibers stretch in the growth direction, providing great strength when bending the material and making it possible to split down the middle. These fibers will have an impact on the thermal conductivity. Along the fibers it’s easier to transport heat, while the large number of interfaces across the fibers makes thermal transport in this direction slower. The reason for this discussion is related to the nature of the measurement methods used here. The TLS method will measure the thermal conductivity in the plane perpendicular to the needle length. The TPS method on the other hand will, in the standard isotropic mode used here, measure the geometrical average of the thermal conductivity. Subsequently, it is expected that a higher value will be measured by the TPS 2500 S, since its results represent all sample directions. The TLS-100 will provide the more conservative cross fiber conductivity in this case. The TLS-100 was set to repeat 5 measurements, utilizing its automatic testing mode. The TPS 2500 S was scheduled to perform 5 corresponding tests, using Hot Disk sensor 5501. The average results from these tests are presented in the table below. With this, it is possible to calculate the anisotropy ratio between axial and radial direction in the wood. It adds up to 1.72 : 1 (axial : radial), confirming that the conductivity in the direction of the fiber length, or growth direction, is significantly higher. 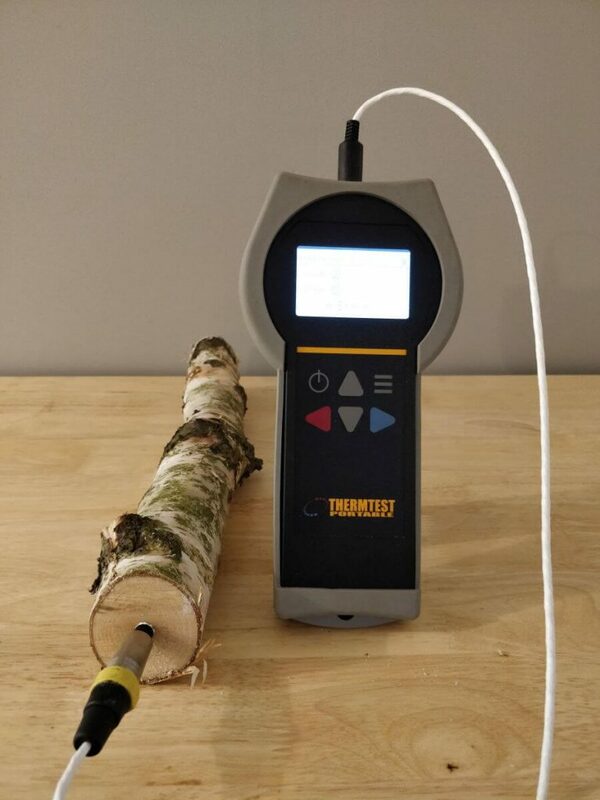 By utilizing two transient thermal conductivity measurement methods, TPS and TLS, the anisotropic thermal conductivity properties of birch green wood has been analysed. This was performed successfully without knowledge of sample specific heat, other material data or reference materials. In a few months we will return to these samples to see how the drying process has proceeded and how it has impacted the thermal conductivity of the wood. Did you find this interesting? Let us know! Internationally, Thermtest has been advancing the measurement of thermal conductivity, thermal diffusivity, and specific heat for 13 years. We are now proud to be present in Europe where our unique combination of advanced laboratory thermal conductivity instrumentation, portable meters, and corresponding accessories, enable us to offer testing solutions to fit most any type of sample, testing application or budget.